Formerly the privately owned Belvedere Hut, the Sangree M. Froelicher Hut was purchased in 2003 by 10th Mountain, thanks to the generous support of many donors. The hut's name honors Staff Sergeant Sangree Mitchell Froelicher, 1st Platoon, Company B, 1st Battalion, 86th Mountain Infantry, who was killed in action in Sassomalare, Italy, on March 4, 1945. The hut was built in 1998. 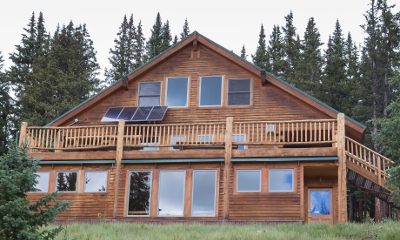 10th Mountain is also pleased to offer the Alpine Resource Center at Sangree's Hut. The Alpine Resource Center is a unique 600 square foot area with its own heat stove, and a comfortable reading, study, and seminar area on the lower level of the hut. Note: the Center will only be available for educational non-profits participating in our Backcountry Exploration Program. Layout and capacity: Upstairs has 1 room with a double bed, 1 room with 4 single beds, and 10 single beds in a communal sleeping area. Capacity 16. The main winter route into the Sangree M. Froelicher Hut follows a combinations of ski trails and old road cuts. Most of the climbing is in the first 2/3rds of the ski in. The first part of the ski trail in crosses private property so please be respectful and stay on the marked trail. The best access into the Sangree Froelicher Hut during the summer is hiking along the marked winter ski trail. The Mt Zion Road does run near the hut but is extremely rough even for 4wd vehicles and is not recommended for summer access. Vehicle access is never guaranteed to any hut at any time. For day hikes around Sangree Froelicher you drop down into the basin below Buckeye Peak and hike to Buckeye Lake or hike to the top of Buckeye Peak itself for beautiful views of the Sawatch Range.